Marriage counseling is supposed to help you get the love you want in your marriage. And, I'm sure you know, that means giving the kind of love your spouse wants to receive. You didn't plan it this way when you got married. Nobody does. Most couples seek counseling when their needs and expectations are not being met. One very important step is to take a look at your expectations, and see if you want to adjust any of those. 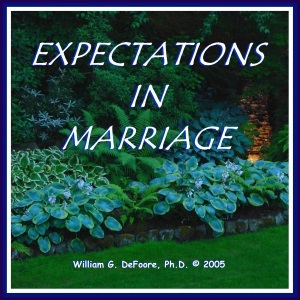 Often, we inherit our expectations in marriage from our parents, and carry them forward unconsciously. Here is your chance to be more consciously aware of what you want and why you want it, while solving your marriage problems and creating the love you desire in the present and going forward. You certainly did not plan for or expect the problems you're having. But you did have some expectations, even though you may not be completely aware of them. You expected to be loved and cared for. You expected to have great romance and a strong sexual relationship. You expected to be each others' best friend and greatest ally. You expected to be able to trust each other. You expected to be able to trust and rely on each other. You probably expected to raise a family, and you expected your spouse to be a certain kind of parent. You might even have expected to "live happily ever after." You didn't expect to lose the passion, romance or sexual interest. You didn't expect the money problems, parenting issues or differences between you that have gotten so big. You want to resolve your issues, to get back the love you lost...or maybe create the love you wanted and never had. To feel safe, loved and cared for. To be able to communicate, and get through the tough times together. To be able to agree on parenting, and how to handle relationships with aging parents and extended family. To laugh, have fun and enjoy each other's company. To feel the love and romance again. And that's where marriage counseling with Dr. DeFoore comes in. Help you identify what went wrong, and how you got to where you are. It will put you in the driver's seat in your marriage, so that you no longer feel like things are out of your control. You will identify exactly what your issues are. If you don't know them, you certainly can't resolve them. You will learn what is your responsibility and what is your spouse's responsibility. You both have your share. You will learn and practice communication skills for resolving conflict and creating a positive, loving connection. You will learn about the roles and boundaries in your marriage, and how you can become the kind of spouse you want to be. You will learn forgiveness, and how to create a passionate, fun, loving connection with your spouse. Contact Dr. DeFoore now to schedule a session, or for a free 15 minute phone consultation. You can even get your marriage counseling online, via phone or video (Skype, FaceTime, etc.). Learn more about online counseling. Most importantly, do not give up on your marriage, or on yourself. You can do this, and marriage counseling can help. Not sure if you need counseling? 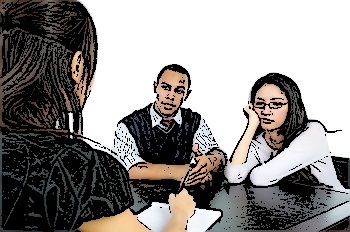 Read 13 Signs You Need Marriage Counseling.